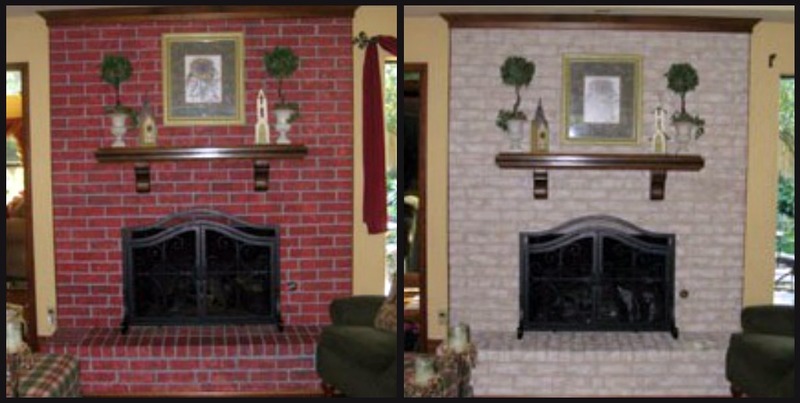 The weekend before Easter, I helped my friend Nanci with her fireplace makeover. She had purchased the color themed matte finished paint kit in Twilight Taupe. I really wanted to make sure that she knew this was simple to do and you have to complete each step in order to get the desired affect she was aiming for. 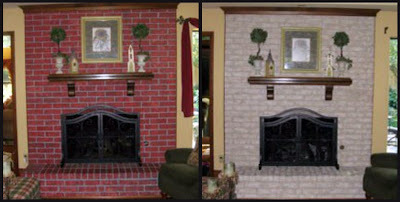 She was in panic mode, she had guests coming in from out of town and she wanted a whole new look to her fireplace. Well, after a few hours of work, here is the before and after photos of how it turned out. I decided to let Nanci tell you how she felt when it was all done. "I could not believe this! It didn't take hardly any time for us to get this done. I absolutely love it and so does everyone who has seen it. I wanted a stone fireplace but that wasn't possible. This gives me the look of stone and my living room looks lighter. The old look was painted red brick and painted gray mortar by the previous owners. I didn't like it and it was chipping too. I am impressed with your product and how simple it was to create the look. I had a professional come in and quote me $750 and I paid way less to get the paint kit, I can not only be proud to say "I did it, but it turned out so much better then someone who wouldn't have cared as much as we did." May I also suggest you check out these beautiful items for your fireplace makeover project? WOW. That transformation is astounding, honestly! I can hardly believe it is one and the same. WEll done, ladies! Stopping by from "make my morning" blog hop. I hope you'll come visit localsugarhawaii.com and share a cup of sugar. We've also got a great giveaway you can enter. I love fireplaces! I wanted a house that had one but didn't get one so I put in a decorative one! I am stopping my brom the Meet up Monday and wanted to say hi! I am a new follower. I blog over at http://www.garagesalesrus.blogspot.com/ stop by when you get a chance! Incredible transformation! It brightens everything up! Thanks for sharing at oopsey daisy! new follower from the blog hop! great blog. What a big difference! Nice work! Thanks so much for linking up at Reasons To Skip The Housework! Beautiful transformation! Thanks for sharing at Beautify it Monday, we hope you'll be back next week!